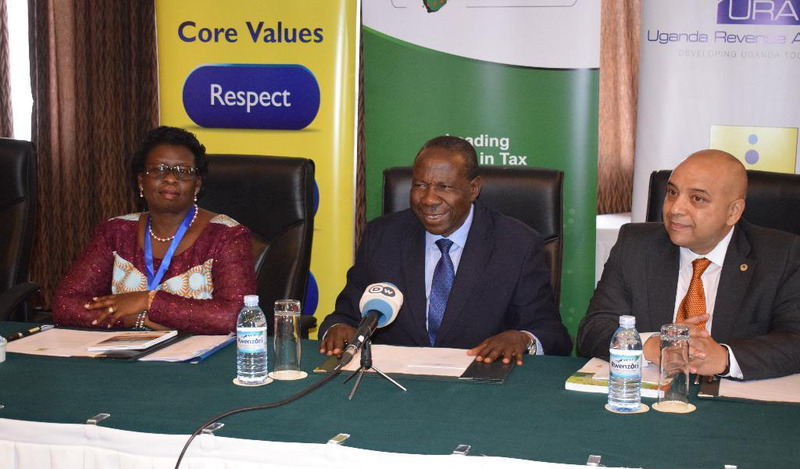 (Left-right) URA’s Doris Akol Finance minister Matia Kasaija and African Tax Administrators Forum Executive Secretary, Logan Wort at the opening of the ATAF on Tuesday. Photo by Badru Afunaduula. Finance Minister Matia Kasaija has cautioned Uganda Revenue Authority, advising that revenue collection should not lead to collapse of businesses. While opening a dialogue on taxation organised by the African Tax Administrators Forum (ATAF), Kasaija said Uganda, indeed any country, cannot afford losing businesses. “The business community is our cash cow. If we over tax it, we will be in trouble. This is my challenge to you. How do we create a balance?. “How do we design a tax regime that will attract more investment and yet still collect revenue? How do we collect revenue fully and finance our budgets so that we do not rely on aid?” Kasaija said at the dialogue which opened on Tuesday and runs through Thursday. Noting that international trade taxes were becoming unreliable, the minister underscored the importance of domestic revenue mobilisation. “We certainly cannot rule out the advantages it offers in terms of greater domestic policy ownership and greater coherence with domestic needs and higher domestic impact,” he said. Earlier, the URA chief, Doris Akol said, among others, the meeting’s purpose was to “find possibilities of improving revenue mobilisation through a more symbiotic construction of tax policy and tax administration”. African Tax Administrators Forum (ATAF) Executive Secretary, Logan Wort urged African countries to design tax systems and models, which are suited to the continent’s conditions. He urged countries to tap into the informal sector as a way of boosting their revenue. Among the participants were revenue bosses from Swaziland, Liberia and Lesotho. Others were policy makers, technocrats and staff of revenue bodies. The Forum is a platform created to improve the performance of tax administration in Africa. It was formed in 2009. ‘Forging a nexus between Tax Policy and Administration in Africa’ is the topic of discussion at the meet ongoing at Lake Victoria Serena, Kigo, Wakiso District.